As a follow up to my last post about Upper Crossed Syndrome, I would like to add information about a related postural problem, text neck. While prolonged hours in front of a computer are a significant contributor to the development of Upper Crossed Syndrome, the constant use of smart phones to text, check email, web browse, and interact with any number of apps also contributes to postural dysfunction and the development of chronic neck pain. In the upper crossed syndrome post I noted that for every inch forward the head travels off the central axis of the body, it adds the equivalent of 10lbs of pressure on the vertebrae of the neck and upper back. 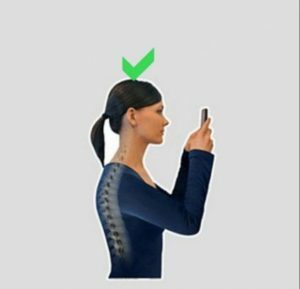 With cell phone use, we can look at neck flexion, or forward head tilt. By tilting the head down by only 15 degrees, the equivalent of 27 pounds of pressure is added the neck. By the time you get to 45 to 60 degrees of flexion, which is where most people hold their head when using a smart phone, it places 50 to 60 additional pounds of pressure on the neck and spine. Over time, that extra pressure, and the strain it creates on the neck can lead to degenerative joint disorders, herniated disks, bone spurs, pinched nerves, and chronic muscle tension and headaches. The slow progression of degeneration caused by this postural dysfunction can go unnoticed at first, and by the time you realize you have a problem, the damage has already been done, so don’t wait until you are experiencing pain before you start paying attention to your posture. Lift your phone. Don’t flex your neck.